plus much more, including free DVD library, WIFI, a sparkling in-ground pool, covered barbeque, pergola area, and an absolutely stunning view over the adjacent parkland lake. is your assurance of quality and value. Located next to the Boonah Visitor Information Centre, we are easy to find near the main roundabout in Boonah. On site managers available for guest check-in. Boonah township, just a gentle stroll from motel, is renowned for genuine country hospitality, legendary country pubs, tavern and contemporary Australian cafes. Relax at our sparkling outdoor pool and BBQ area. Enjoy the tranquility of the adjacent Bicentennial Lagoon, with its natural setting and abundant birdlife. Top quality, freshly pressed linens ensure you have a comfortable nights rest. 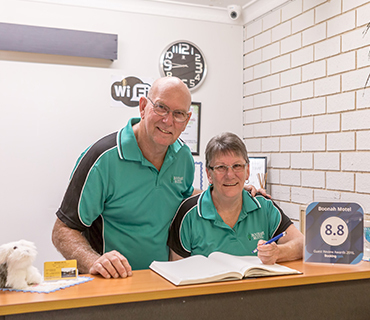 Guest suites achieve a 93% rating for cleanliness and comfort – one of the highest ratings in Queensland! Come visit and check us out we would love to make you welcome! Call 07 5463-1944 for more information, or book online at the top of this page. We are happy to assist with providing travel /function information about the Boonah area. At Boonah Motel you'll be 2.9 km (1.8 mi) from Boonah Golf Club and 4.1 km (2.5 mi) from Templin Historical Village. Highlights at this motel include an outdoor swimming pool and in-room free WiFi. You can enjoy TVs with DVD players, and all 16 rooms feature coffee/tea makers, ceiling fans, and hairdryers. Microwaves and Crockery make in-room dining convenient. Additionally, irons/ironing boards and free toiletries are available. Limited housekeeping is available. This motel has free WiFi in public areas, a garden, and barbecue grills. Continental breakfast is available. There's also the convenience of free self parking. Sights within a 20-minute drive of this 3.5-star Boonah motel include Moogerah Dam and Kooroomba Vineyards and Lavender Farm.